We were driving the other day and saw a creature that made me giggle. It always makes me giggle when I see one! What is it you ask? The Geococcyx, better known as a Roadrunner. 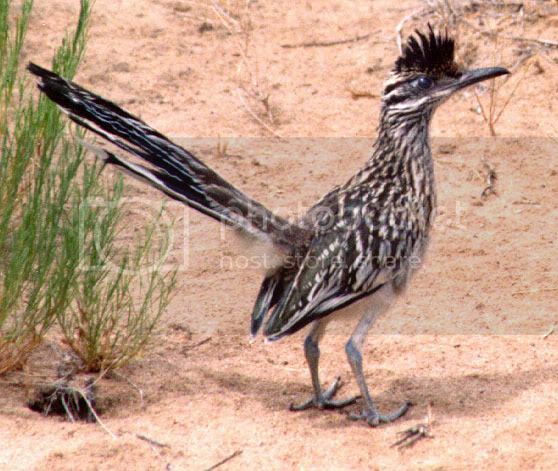 The Roadrunner is considered a ground cuckoo. They can grow up to 18-24in in length and 10-12in high. Roadrunners can run at speeds of up to 15 miles per hour and generally prefer sprinting to flying. If they are being chased by a fast predator they opt to fly. Here's something really sweet--they are monogamous and a pair may mate for life.